Thomas McGill, his wife Mary Douglas and son Archibald are all buried in Carsphairn Kirkyard (number 153 shown on kirkyard map). Archibald McGill, born in 1818, married Grace Martin whose family lived at the leadmine. Grace's family is well documented in another folder and on the boards. His sister Sarah married a leadminer. 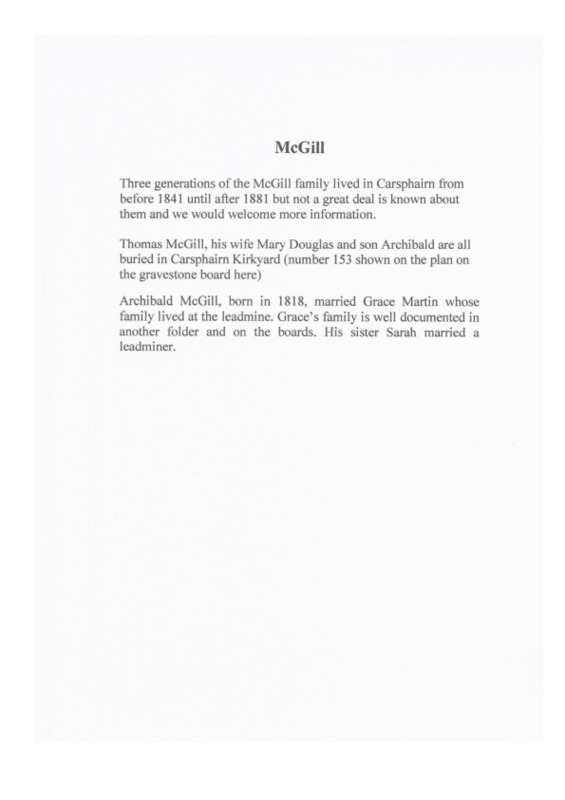 IS, “McGill Family History,” Carsphairn Archive, accessed April 20, 2019, http://carsphairn.org/CarsphairnArchive/items/show/82.